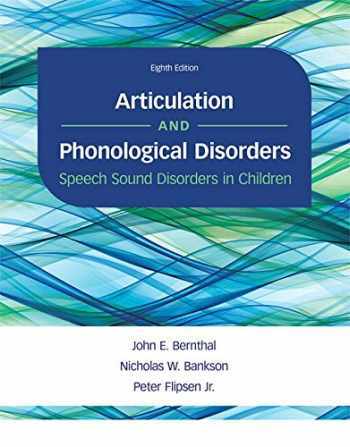 Acknowledged author John E. Bernthal wrote Articulation and Phonological Disorders: Speech Sound Disorders in Children (8th Edition) comprising 400 pages back in 2016. Textbook and etextbook are published under ISBN 0134170717 and 9780134170718. Since then Articulation and Phonological Disorders: Speech Sound Disorders in Children (8th Edition) textbook received total rating of 4 stars and was available to sell back to BooksRun online for the top buyback price of $80.59 or rent at the marketplace. The leading, most current and comprehensive review of information critical to the study of clinical phonology available. Long renowned for providing the most up-to-date, extensive coverage of the clinical literature in the area of speech sound disorders available, this leading resource has earned its status as a classic in the field and its rightful place on every speech, language, and hearing clinician’s bookshelf. Readers get an introduction to the normal aspects of speech sound articulation, normal speech sound acquisition, classification and factors related to the presence of speech sound disorders, the assessment and remediation of speech sound disorders, and phonology as it relates to language and dialectal variations. Rather than prescribing a single approach to speech sound disorders, the authors present a range of perspectives on the nature, assessment and treatment of these disorders. Articulation and Phonological Disorders is primarily concerned with those disorders not etiologically associated with known or obvious sensory, structural or neuromotor deficits. Among the changes and updates to the Eighth Edition are an expanded focus on evidence-based practice, the reorganization of several chapters, and an updated discussion of childhood apraxia of speech.